The wide-ranging, moderated conversation with Emmert was followed by audience Q&A. Video of the conversation with Mark Emmert. 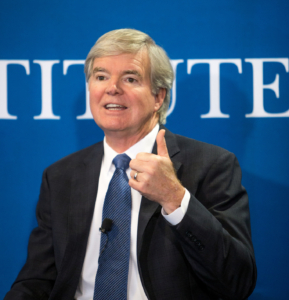 Mark Emmert became the fifth president of the NCAA in 2010. Before then, Emmert was president of his alma mater, the University of Washington, beginning in 2004. He also served as chancellor of Louisiana State University (1999-2004), provost and chancellor of the University of Connecticut (1995-1999), provost and vice president for academic affairs at Montana State University-Bozeman (1992-1995) and associate vice chancellor for academic affairs at the University of Colorado, Boulder (1985-1992). Emmert graduated from Washington with a degree in political science and has both a master’s degree and Ph.D. in public administration from Syracuse University. Emmert and his wife DeLaine have two adult children and three grandchildren.